Golden Lion Lane, originally the eastern section of Lombard Street, ran from High Street, Old Portsmouth towards Quay Gate, later King George's Gate, which gave access to the Camber. It is present on all maps from 16C onwards and although rather narrow, (13ft 6ins. at the High Street end) it had allowed adequate access for much of it's history. In later centuries however it became part of a principal route from Portsmouth Town to the Dockyard and the expanding town of Portsea and as such became unable to cope with the traffic. The problem came to a head in the mid 19C when Golden Lion Lane frequently became blocked due to vehicle breakdown or fire in buildings fronting onto the street. The final straw was a blockage reported by the Hampshire Telegraph on 18th July 1868 when "... a heavy piece of ordnance was being taken from the Gunwharf, the horses attached to the carriage brought the wheels in contact with the kerb at each side of the road and being thus jammed the combined efforts of a large number of horses and men ...failed to move it". This continued for three quarters of an hour until a part of the kerb was removed, so releasing the carriage. The widening of Golden Lion Lane was particularly relevant to local traders for another reason. Not only had Portsea become an important town in it's own right, so had Southsea and the direct route between the two lay along Golden Lion Lane and it was feared that if the Lane was not widened then the majority of traffic would be diverted along St. Georges Road towards Wish Lane (now Kings Road) so by-passing the whole of Portsmouth town with the inevitable loss of trade that would ensue. This is not to say that Golden Lion Lane was the only impediment to through traffic, as King William's Gate at the end of Pembroke Road was so narrow as to permit traffic passing in only one direction at a time. Many Councillors, notably Mr. R.W. Ford, believed that the widening of Golden Lion Lane would signal a death knell for the gate. By 1868 the Council were actively considering a widening of the thoroughfare, but this brought with it a major problem in that the churchyard around St. Thomas's Church (now the Cathedral) extended to the edge of Golden Lion Lane and was full of burial plots which would have to be compromised in order to accommodate the widening. In July 1868 the first steps to widen the road were taken at a meeting which was reported by the Hampshire Telegraph. "The meeting was convened by the Vicar of Portsmouth (the Rev. Edward P. Grant) in the vestry-room adjoining the parish church. The Vicar presided and there were also present—Messrs. Aldermen Sheppard, Alderman Hellard, Alderman Emanuel, Chambers, Ogburn, Moorshead, Gillman, Bloxham, Whiting, Newland, Batchelor, Lewis, Bradley, McCheane, R. W. Ford, Rake, Elcock, Wallis, Howell. Dr. Raper, Captain Conway Gordon, &c. &c. As this represented rather more people than the vestry could conveniently accommodate, the meeting was adjourned to the Guildhall across the street ... "
The meeting then considered a proposal to be put to the Warden and Fellows of Winchester College whose permission would be required should any part of the churchyard be needed for the widening of Golden Lion Lane. They went on to consider the need to purchase property at the High Street end, notably No. 103 on the northerly side which belonged to Mr Traylor and No. 102 on the southerly side which was owned by Councillor Emanuel who rented the property to Mr Lewis. The former was considered too expensive to buy whereas Councillor Emanuel was willing to accept the same price for No. 102 as it had cost him 20 years earlier. In this the Councillor was being somewhat disingenuous in that No. 102 was a wide building and only half would be required. The potential desecration of any graves or vaults in the churchyard was a serious issue to some but to others it was irrelevant what happened to a person's bones after they had died and no one had been buried in that section in the previous 30 years. It was also pointed out that the churchyard had undergone many alterations over the years, including the laying of paths directly over the site of known graves and that this would be just one more change. One plan put forward would minimise the effect on the churchyard. This involved the removal of half of No. 102 High Street and a strip of the churchyard about 40 metres in length and 8 feet in width. The road would then bend slightly northwards for 8 feet before resuming it's previous direction. This would completely avoid that part of the churchyard to the north-west of St. Thomas's. There was a problem with this however and it was not immediately reported in the Hampshire Telegraph, namely that if the churchyard was to be saved then the extra width required could only come from the houses on the north-east side of Golden Lion Lane. The meeting, having discussed all these and other issues was brought to a vote, but they made no attempt to decide on the final route of the widened road, they simply agreed, by 23 votes to 6, that in principle they would pay for the work to be carried out. They did not, however, vote for any specific sums of money to be devoted to the scheme despite having been told that it could be completed at a cost of £2000. Even during the meeting there had been expressed serious doubts about the wisdom of spending taxpayers money on the scheme and subsequently this view spread widely amongst the population at large. This was largely based on the view that the Town of Portsmouth may contain the administrative headquarters of the whole Borough and be one of the main centres of commercial activity, but it's population was rather small in comparison to the rest of Portsea Island. Consequently the widening of Golden Lion Lane seemed to offer a disproportionate advantage to a few already well heeled gentlemen whilst the majority of the populace, particularly in the Landport area, were living in slums without adequate provision of basic services. At another meeting held in Landport in March 1869, between 1 and 2 thousand people voiced their objection to the spending of public funds on the project. This must have been an impressive occasion as the Hampshire Telegraph devoted an entire page to a report on the proceedings. 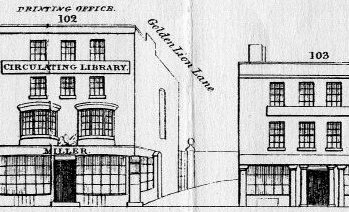 Notwithstanding the objections raised at the meeting, the widening of Golden Lion Lane did go ahead, being completed in October 1870. 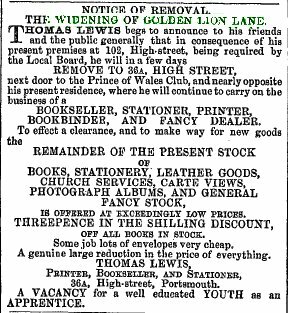 The Hampshire Telegraph of 9th October included an advertisement placed by Mr. Thomas Lewis of 102 High Street who announced his closing down sale. Mr R.W. Ford's prediction that the demolition of King William's gate would follow the widening of Golden Lion Lion proved to be accurate as the gate did indeed come down within a year thereby opening up the thoroughfare to traffic to and from Southsea. Although the Hampshire Telegraph gave considerable coverage to the widening, it made no mention of the final plan which did involve a 'dog-leg' in the road as shown on the map above. 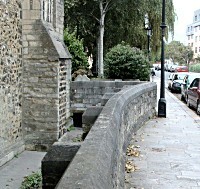 The evidence for this survives in both the wall of the churchyard (see photo above) and the angle to the street of one of the houses in Lombard Street. What is not readily apparent, yet must be accepted, is that the facades of the houses in Golden Lion Lion must have been moved back approximately 8 feet. Today this seems unlikely as the frontages appear to be much older than 1870, but it was surely not beyond the skills of the builders to re-create them exactly. The name 'Golden Lion Lane' did not survive long after the widening before the whole thoroughfare became known as Lombard Street. After World War 2 the street was straightened again, which necessitated a further incursion into the churchyard. In 2008, an archaeological dowser, Laurie Booth, verified the route of the original Golden Lion Lane and located the position of the church path gatepost that can be seen in the drawing at the top of this page. He placed it a few inches from the edge of today's kerb, about 8 feet north-west of the current path into the church. 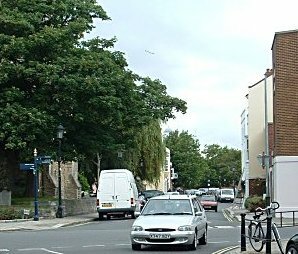 The following article on Golden Lion Lane by Ray White was first published by the Friends of Old Portsmouth Association in their Newsletter No. 17 in 2003. We are indebted to FOOPA for permission to re-publish on this site. The southern end of Lombard Street, until about 1881, was known as Golden Lion Lane. The Golden Lion Inn, which no doubt gave the lane its name, was still in place in that year on the site now occupied by No 2 Lombard Street. The earliest reference to Golden Lion Lane that I have been able to find is an entry in the rate book of 1781, although there was no mention of the Golden Lion Inn. The rate books of 1730 until 1759 made no mention whatever of Golden Lion Lane. Sadly the rate books are missing entirely from the years 1759 until 1780. The first reference to the Golden Lion Inn I found in a street directory of 1798 when one Thomas Slight was the proprietor. The rate book of 1814 lists the residents of Golden Lyon Lane (sic) as G Slight, W Richards, G Humphries and H Gloge, also listed was Tats Billiard Room. An important and revealing find in the City Records Office was the original sketch plan of properties in Golden Lion Lane subject to a Compulsory Purchase Order of 1869, possibly the first made in Portsmouth, for the purpose of a road widening scheme. A total of 16 "plots" were involved, several of which were outhouses and stables attached to the Golden Lion Inn. Also included on the west side was a "house in the churchyard" on the High Street corner, and "land forming part of St Thomas's churchyard", a strip running from the aforesaid house to a midway point towards St Thomas's Street. The overall effect would be to widen the road on opposite sides by several feet, on the Cathedral side at the south end and on the opposite side at the north end, thus creating a midway kink the remnants of which can still be seen today. 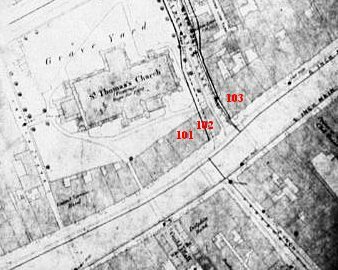 8 years before the Compulsory Purchase Order was enacted, the census of 1861 reveals that a total of 56 occupants were declared to be living in 11 habitations in Golden Lion Lane, 26 of these in "Golden Lion Court". 10 years before that 43 occupants were listed. Between the years 1870 — 1874 there is no record in the rate books or street directories of Golden Lion Lane (this must have been the period of demolition and reconstruction). The year 1875 has an entry in "Kelly's" naming the Golden Lion Inn with J H Grist as proprietor with the 4 adjoining properties. It would appear that the Inn was rebuilt but on a smaller scale than the original. There was no numbering system at that time in Golden Lion Lane. The first evidence of house numbering comes in the census of 1881 when The Golden Lion Inn was numbered 2 and the adjoining houses, strangely, 3, 31/2, 4 and 5. This is possibly the year in which Golden Lion Lane became part of Lombard Street although both ends were still independently numbered. The Kelly's of 1883 has the Inn as No 1, with 2,3,4 and 5 following logically. This numbering continued until 1887 when the occupants are listed in Kelly's as : No 1 the Inn (proprietor C P Shearsby), No 2 R Smithers (tailor), No 3 F Ward (hairdresser), No 4 Luigi Deluchi (ice cream maker) and No 5 S Thomas (boot maker). The Kelly's of 1888/1889 has the first listing of present day numbering which is 2,4,6,8, and 10. The last mention of The Golden Lion Inn comes in 1894. Thereafter it seems that, after lying empty for several years, it was occupied by various tenants including in 1913/14 Rowland Loader (harness maker), 1920 a Mrs Bramble and then in 1929/30 Silvester Doran (dentist) who remained in practice there until the night of January 10th 1941 when it was burned to the ground as a result of enemy action. In the late 1950's plans were afoot once again to acquire, by compulsory purchase, numbers 4,6,8, and 10 Lombard Street. Also included was No 52 St Thomas's Street on the corner. Not included was No2, a post-war construction which was set back a few feet when built with, no doubt, this in mind! Thankfully, history did not repeat itself for, in the event, in the year 1963 the road was widened by acquiring a strip of the Cathedral ground running from the entrance of the Memorial Garden to the corner of St Tomas's Street. The lovely old wall was carefully dismantled, each stone was numbered, and the wall was rebuilt several feet further back. As this was a former ancient graveyard, many old bones were disturbed in the process. Then in 1965 a Compulsory Purchase Order was issued, almost 100 years after the first one, which affected about 24 properties in Old Portsmouth including Nos 4,6,8, and 10 Lombard Street. The ultimate aim was to also demolish properties in St Thomas's Street from Nos 47 – 52. This would have created a total clearance from High Street across to St Thomas's Street. The High Street area was already cleared having been destroyed by the incendiary bombs dropped on the night of January 10th 1941 when so much of Portsmouth burned (including the Guildhall). My grandparents, who had been living here at No 6 Lombard Street since 1894, took shelter with other residents on this night in the crypt of the Cathedral. Fortunately, the owners of the properties involved combined to fight this vandalism and the order was rescinded in September 1967 (subject to bringing the affected properties up to a standard set by the Public Health Inspector). These same properties in St Thomas's Street have long since been accorded Listed Building status while those in Lombard Street have more recently been placed on a Local List of Buildings of Architectural or Historic Interest.